I was curious about the Oscar category, Best Song. When did it begin? Were all of the winners of this category associated with great winning movies or were some attached to non-winning films? Was there a songwriting team that won this category more than others? Why was this category begun? The very first Academy Awards was held on May 16, 1929, and there was no category for Best Song. Warner Brothers did receive an “honorary award” for making The Jazz Singer, the first motion picture with dialogue spoken by the actors that audiences could hear; silent films would thus be on their way out. Moving forward in cinematic history the year 1934 brought the Best Song category to the Academy Awards. The reason this category was added was to emphasize, or rather put a spotlight on, a film’s music. This focus would show the public and the critics the importance music was in the making of a film. Rules were created for this award: the award was to be presented to the songwriter(s) and not to the song’s performer, unless the performer happened to also be a part of the team of musicians and lyricists that wrote the song. Nominations had to be made by Academy members who were songwriters and composers. 1934’s first ever Best Song winner was “The Continental” from the film The Gay Divorcee, a wonderful Fred Astaire and Ginger Rogers film. Music was by Con Conrad and lyrics by Herb Magidson. Here is a link to a great clip of Astaire and Rogers dancing to the winning song. Other notable winners for Best Song in the 1930s: “Thanks for the Memory” from 1938’s The Big Broadcast of 1938 and “Over the Rainbow” from 1939’s The Wizard of Oz. The 1940s arrived and a bit of Best Song controversy erupted during the 1941 Academy Awards. American composer Jerome Kern was upset because a song he had written in 1940 with Oscar Hammerstein II, “The Last Time I Saw Paris” won the award. Kern was upset because he had written that song and it had been recorded before the film it was put in, Lady Be Good had even been made. To prevent this from ever happening again, Kern got the Academy to create another rule: only songs which are original and written specifically for a movie are eligible to win. Of course, this new rule would now impact whenever any stage musicals were turned into movies. None of the well-known tunes from a hit musical could be nominated so that’s the reason as to why when a hit stage musical becomes a movie, there is a new song to go with the movie version, in the hopes that the new song will be nominated in the Best Song category. A lot of popular songs were in the crop of 1940s winners: “When You Wish Upon a Star” -1940, Pinnochio, “White Christmas”-1942 Holiday Inn, “Swinging on a Star”-1944 Going My Way, “Baby, It’s Cold Outside”, -1949’s Neptune’s Daughter. Here’s a link to “Baby, It’s Cold Outside” and the original singers of that hit song, Esther Williams and Ricardo Montalban, Red Skelton and Betty Garrett. The 1950s, no controversies with the Best Song category and here are some of that decades notable winners: “Mona Lisa”-1950 Captain Carey, U.S.A.. “The Ballad of High Noon”-1952 High Noon, “Secret Love”-1953 Calamity Jane, “Three Coins in the Fountain” 1954 Three Coins in the Fountain, “Love is a Many-Splendored Thing” -1955 Love is a Many-Splendored Thing, and “Que Sera, Sera(Whatever Will Be, Will Be)”-1956 The Man Who Knew Too Much. Here is a link of Doris Day singing “Secret Love”. 1960’s -there were two songs that stood out to me in this grouping of winners. First was “Raindrops Keep Fallin’ on My Head”-1969 Butch Cassidy and the Sundance Kid because according to my mom, my 5 year-old self loved this song! I really can’t recall saying that, but I guess I must have. The second song was Andy William’s version of “Born Free”, -1966 Born Free. I was only a 1 year old when that song came out, but I did see the film when it aired on one of the big networks when I was older and that song stayed with me after I saw the film. Of course, I can’t ignore “Chim Chim Cher-ee” -1964 Mary Poppins, which was a hit before I was born and was a favorite film of the nieces to view at my in-laws home over family get-togethers. I won’t continue on with this look at Best Songs because in my opinion, films from the 1970s and forward aren’t exactly classics, in my mind. If you are curious to discover the Best Song winners from the 1970s onward, then you may do so, on your own! However, I will answer my last question that I had, and who has won the most Best Song Oscars? It is a 4-way tie! Sammy Cahn, Alan Menken, Johnny Mercer, and Jimmy Van Heusen. 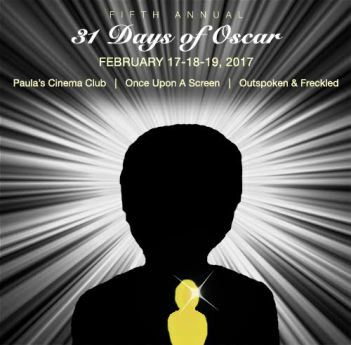 This post has been for the 31 Days of Oscar Blogathon, hosted by three wonderful classic film fans: Kellee of Outspoken & Freckled, Paula of Paula’s Cinema Club, and Aurora of Once Upon a Screen. Please visit their sites to read all about the Oscars, with great posts written by other classic movie fans! Very nice post! I like that you included some personal connections ot some winners from the 1960s. The Best Song is such an interesting category that seems to bring more variety than most categories. And so much variety you showcase here- great piece! Thanks so much for contributing to our blogathon!